Q: Can you improve our street presence? Why did SkyBus contact Angle? 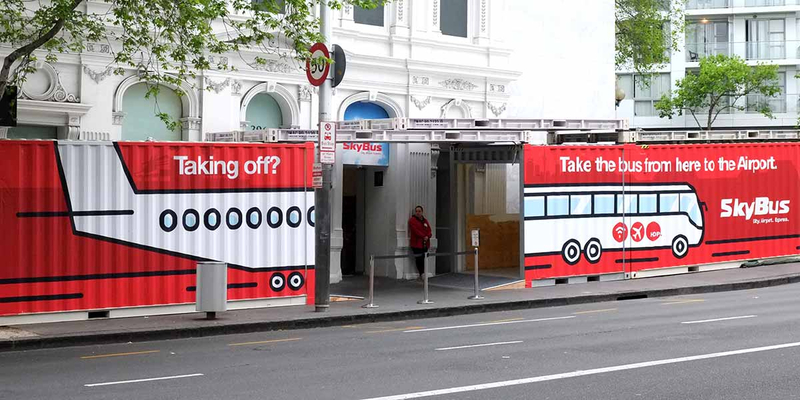 SkyBus needed help with large scale signage design to improve street presence at their SkyBus City Lounge, 396 Queen Street, Auckland. The lounge is their hub in the city, offering customers a place to relax, book tickets, stay connected with WiFi and watch the latest flight information from Auckland Airport. Construction work in the building meant that shipping containers had been placed directly in front of the lounge, blocking any street presence in this busy part of Auckland’s CBD. Step 1: As with all the signage projects we undertake, we started with a site visit. We took site photographs and documented initial measurements, followed by a conversation with SkyBus’ Group Operations Manager and Business Devlopment Manager for their input. Step 2: We explored multiple high impact design concepts that we knew would make good use of the available space and communicate the benefits of SkyBus. Photoshop visuals were created to show a life-like representation of the finished signage in place. All concepts were then presented to the client. 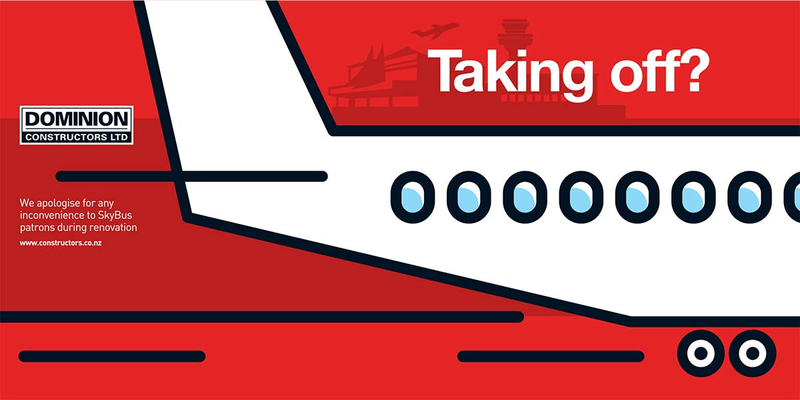 Step 3: After quick approval of a preferred concept, we created the final vector illustration and pieced together a second proof for SkyBus to check. Step 4: The old adage ‘measure twice, cut once’ applied at this point. We re-measured the containers and checked all the surface details and features to make sure our design worked seamlessly across the 3 containers. Armed with this information, we discussed the finer production details with our print partner and installer. 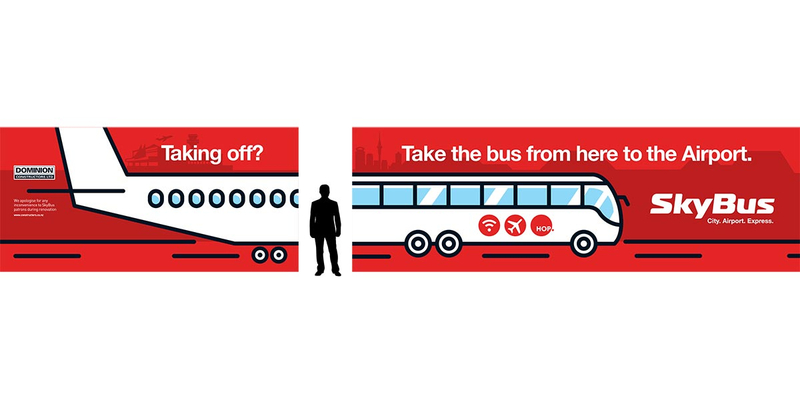 Step 5: Our final scaled artwork was created and approved by SkyBus. This was supplied to our print partner and the 2.9m x 15m design was printed in sections 1.3m wide x 2.9m high. Step 6: The finished laser-cut vinyl print was given to our installer and wrapped across the front of the row of containers. 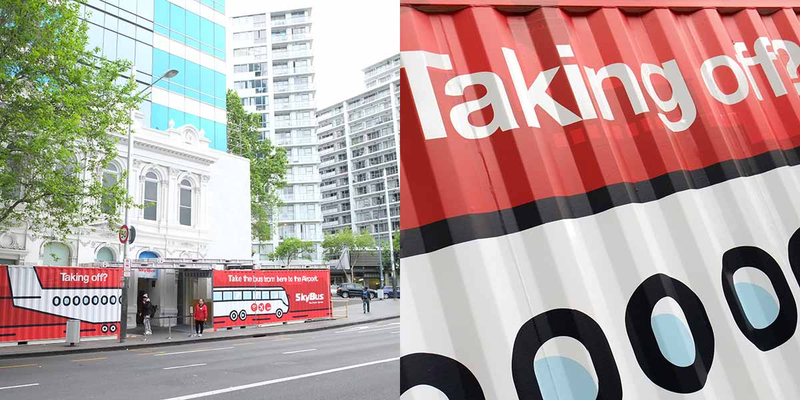 The creative solution for the signage design is inspired by the 24/7 SkyBus service, connecting Auckland City to Auckland Airport. 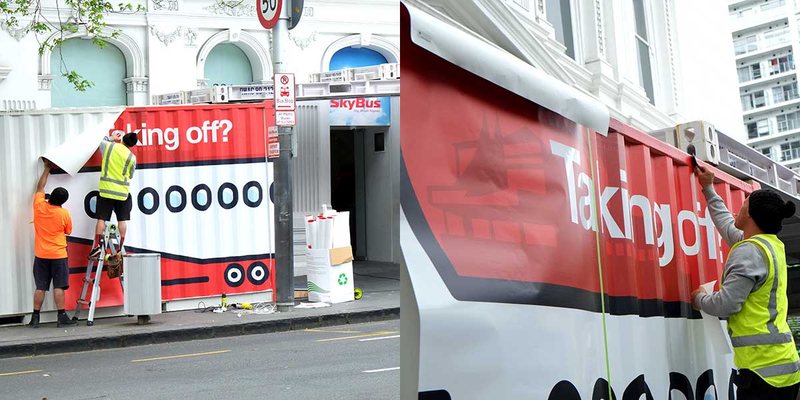 Having already created the branding for the SkyBus fleet in Auckland, we knew the service and its benefits well. Is it a plane? Is it a bus? On the left hand containers is a large illustrated section of a passenger plane on a runway. A hint of the airport is visible behind. On the right hand container is the iconic SkyBus on the road. A hint of the Auckland skyline and stylised maunga are visible behind the bus. 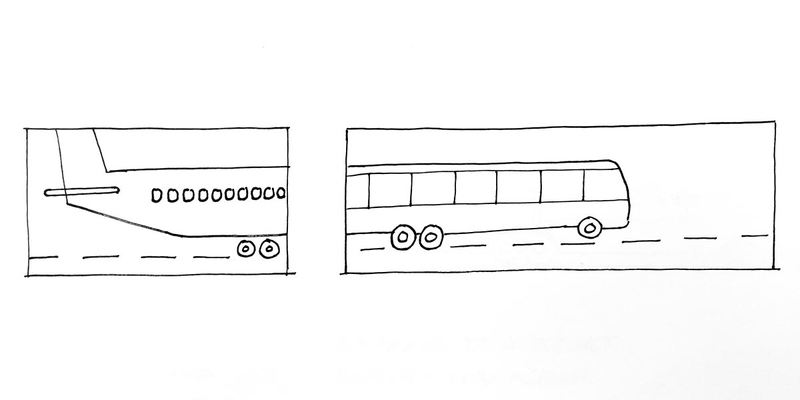 The two modes of transport are illustrated in the same style and the viewer visually connects the two together across the gap between the containers. The signage is completed with a smart headline, a large SkyBus logo and an apology message from the construction company to SkyBus patrons. 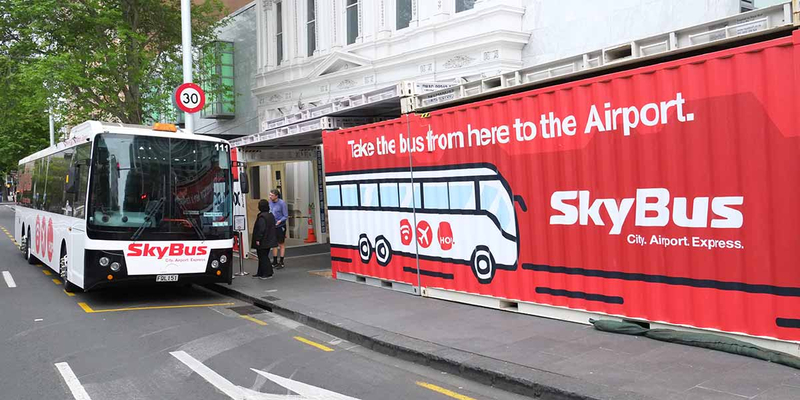 The result turns this unavoidable obstacle into a highly visible billboard, advertising the SkyBus service for the next 6 months. Do you need a branding company that designs signage? We are communication experts that understand space, dimension, scale, materials and production techniques. 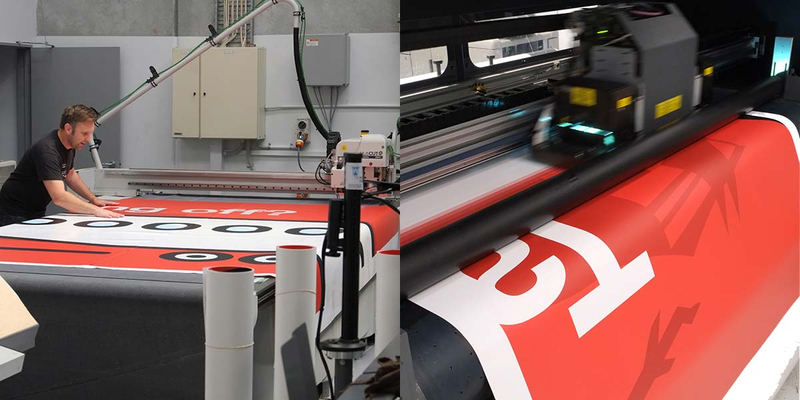 Find out about our signage design services and how we use them to build brands with a big impact. Finish Container grade vinyl digitally printed with UV inks. Production 1.3m x 2.9m sections printed, laser cut and wrapped onto container surface.